A compelling and provocative mystery exploring the complexities of identity, loss and redemption. The Unquiet Dead is a contemporary mystery based on actual events that occurred during the 1992-1995 Bosnian War. It is impeccably researched and includes actual passages based on the testimonies of witnesses of the massacre of Srebrenica. Christopher Drayton's body is found at the foot of the Scarborough Bluffs and Detective Esa Khattak and Rachel Getty are called to investigate. But this is a very complex case as once the investigation begins, secrets of Drayton's role in the 1995 Srebrenica massacre surface. It's difficult to remain objective and in a community so haunted by war, anyone could be a suspect. And also, as this victim is a man with so many deaths to his name, could it be that justice has at long last been served? 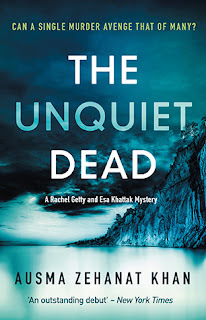 The blurb reflects the intensity and complexity of this book's themes and setting but Khan's skilful writing ensures that The Unquiet Dead is an accessible and highly readable novel. Although there are a lot of distressing passages, it is an important story and one that is well worth making the time to read. I think one thing that creates an impact from the very beginning is the line of italics that starts each chapter. These are lines taken from witness statements and testaments from the International Criminal Tribunal for the former Yugoslavia as well as other legal documents and historical records (all listed at the back of the book). "Whoever was on the list to be killed would be killed." Her inclusion of these lines is purposeful and effective. Not only does this show the depth and detail of Khan's research and her passion for wanting to tell this story accurately even though she has weaved it into a fictionalised story, but it also adds a chill to the pages. Khan's balance between using real events, telling a devastating story but also writing a modern mystery thriller which grips the reader is perfect. This is an author with a great skill for language, structure and story telling. 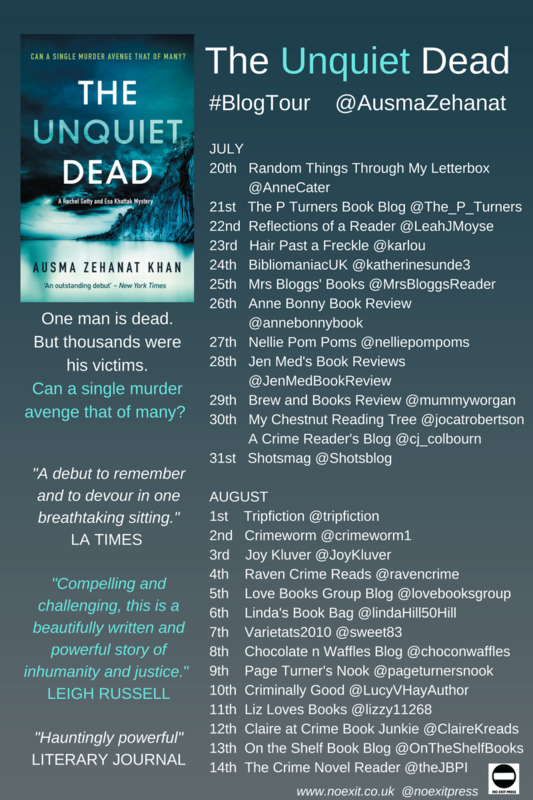 This is a striking novel and The Unquiet Dead will leave its mark on any reader. Khan's main characters are engaging, very well developed and crafted. I liked Rachel a lot, she had her own personal issues to deal with, a colleague to learn to work alongside effectively with and also her own personal emotions connected to the crime. She's thoughtful, calm, intelligent and focussed. I liked the way Khan revealed her ability and skill, the dynamics between herself and Khattak which were not always easy and her approach to solving the mystery of the dead body. "She would tell him, she decided. This mucking about in the dark was pointless. It was getting them nowhere." Her relationship with her brother is very well crafted and explored. Khan expands this exploration of family dynamics with the introduction of a few different families and quite a large cast of characters. There are conversations and observations about siblings, motherhood and parenting. This helps not to only to add more layers to the novel but also make it more universal. Although predominately told from Rachel's point of view, there are also some short chapters written in italics. These sections increase towards the end of the novel but are well timed and well balanced. I actually found them incredibly moving but also fascinating as they evoked the emotion, horror and atmosphere of the events so vividly. "Noise. Chaos. Terror. Misery. Four words that now made up his world." I have read painfully evocative novels set in WW2 which have never left my memory and for me, these passages from The Unquiet Dead will join them. Perhaps there is something a little more terrifying here because I was less familiar with the events on which they were based and it was harder to process that this massacre actually happened. The themes of hatred, fear, redemption and justice are universal themes that repeat themselves throughout history and throughout the history of literature and Khan shows herself to be able to write as beautifully, as poignantly and as confidently as any other novelist tackling controversial and complex topics. I think the other thing I really found fascinating in the novel was the role of Christopher Drayton and his duplicity and outward presentation of the person he wanted everyone to believe he was while duping everyone and disguising his past. This was really intriguing and I was captivated by the unravelling of his public persona as the truth was gradually uncovered. In terms of mystery and suspense, this was highly effective. "People were full of contradictions, bewildering even unto themselves." "We owe the living the truth. It's the only coin of justice left to offer." The Unquiet Dead is powerful and unforgettable. It is a book to be devoured in the same way we devour other contemporary authors who produce thought provoking novels. I highly recommend The Unquiet Dead which is published on 27th July by No Exit Press. 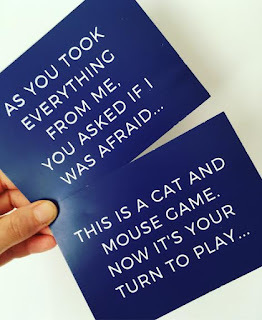 My thanks to the publisher for an advanced copy in return for an honest review and for the stunning PR campaign of mysterious postcards that arrived before the copy of the book! DON"T MISS THE BLOG TOUR FOR THE UNQUIET DEAD! HERE ARE ALL THE OTHER STOPS SO DO TAKE A LOOK!! !